Is there one best motivation technique? So far we have been talking about what it will take to get from where you are, wherever that might be, to the place you want to go. I have defined that place as having a happy life – whatever that might mean to you. Last year I also posted a series of pieces about stages of change, how it is that we think people go about changing. While each of you may be in a different stage of change and we may all be in different stages of change for different problems, the focus of the posts this month is on gathering information so you can decide for yourself what, if anything, you want to change. One aspect of making these changes we will need to talk about is motivation. This post is meant to be an introductory post on the topic of motivation. 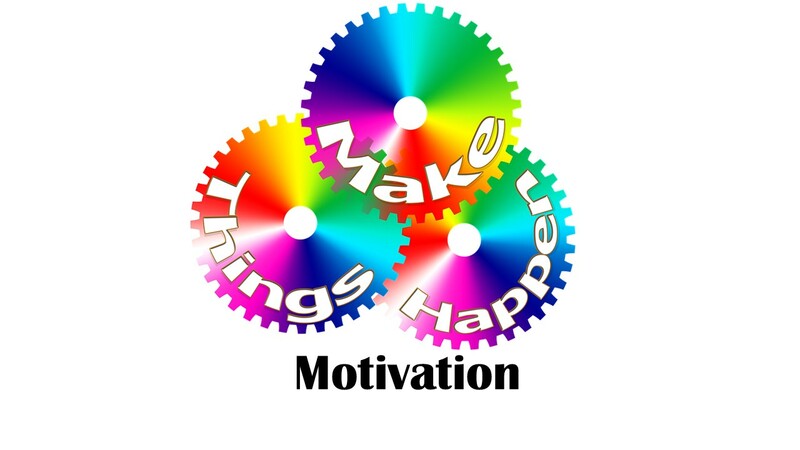 In “Motivation Month” there will be a longer series of posts on other aspects of motivation. There is lots of material on the web about motivation, plenty of motivational speakers and books on motivation. Some motivational methods work well for some people, some of the time, but no motivational program seems to be a clear success all of the time. One consideration in designing a motivation program is who you are trying to motivate. One set of techniques may be more effective for self-motivation and another set works better for motivating others. Psychologists have been studying the way in which personality factors – sometimes reported as the “big five” factors influence motivation. They influence other parts of your behavior and feelings also. There is some disagreement as to how much of personality is genetic and how much is learned. I think both factors play a role and therefore you start where you start but you can learn to be otherwise. Here are the big five factors. Extroverts want the money or fame. People who are extroverts are more likely to be motivated by more tangible status related rewards than introverts. Extroverts want to raise their status. Fame, attention, high salaries are all likely to motivate the extrovert. Bosses will find tangible rewards, money, a corner office or a prime parking space are likely to increase the extroverts motivation. If you are looking to raise your status and need to self-motivate look for activities that will bring you into contact with lots of people. Networking, speaking before groups, making an increased number of calls, all these things are likely to motivate you and to increase your productivity. People who are high in agreeableness are motivated by getting along. They value communication. Not the kind of communication that is aimed at getting someone to do what you want them to, but the sort of communication that involves really understanding and being understood. Agreeable people will work for less money if they feel that their coworkers are friends. They are excellent candidates for morale or social committees. They may be more motivated by working in an altruistic setting like a nonprofit even if the money is less. Conscientious people need to get things done. A person who is high on conscientiousness is task oriented. They like to be able to work on a project where they can see the results of their efforts. They are big on self-discipline. They show up for work on time, not because someone is watching them but because it is the “right” thing to do. They are likely to be internally motivated. If you need to motivate a conscientious person, make sure they know the rules and expectations of the job and why these things are important. People who are anxious are sometimes referred to as being low in emotional stability. They will be motivated by results that improve their security. Anxious people will be more motivated by a long-term promise of secure employment or a pension fund than by current high salaries. If you are high in anxiety you can increase your motivation by planning ways to increase your security. Most people are one paycheck away from being homeless; saving up 6 months or more in living expenses can be very motivating to an anxious person. Personality type is not the whole answer to motivating yourself and others but it is one point to begin your thinking about the role of motivation in your journey towards having a happy life. Through this year there will be more on the topic of motivation. Stay tuned as we help each other design and move towards happier, more rewarding lives. This entry was posted in Motivation and tagged Big five personality traits and factors, co-occurring disorders, Emotions and feelings, Happiness, memory, motivation, recovery and resilience by David Joel Miller. Bookmark the permalink. Thanks. Have a great – what ever it is there now.